Are you tired of toxic cleaning products filling your apartment with strong fumes? Do you hate wasting your hard-earned money on specialty cleaners? Then it's time to stock up on white distilled vinegar. 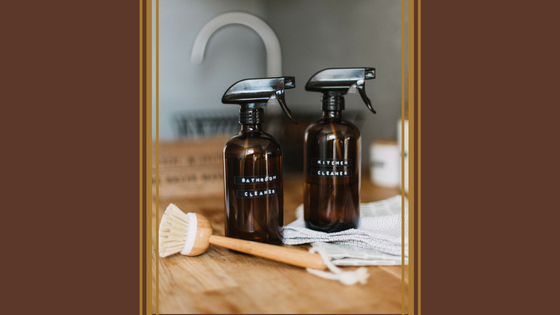 This environmentally friendly liquid is very acidic, so it's an excellent cleaner and also very effective at killing some common germs, including pathogenic strains of E. coli. If your showerhead is clogged, you can use vinegar to rid it of mineral deposits. Just fill a small plastic storage bag with approximately a cup of vinegar. Cover the showerhead with the bagful of vinegar and rubber band it in place. Leave on overnight. Remove the bag in the morning and turn on the water to rinse off the vinegar and mineral deposits. Freeze some vinegar in an ice cube tray. Place the vinegar cubes in the garbage disposal and run the cold water. Turn the disposal on so that the cubes can clean the blades. Add a half cup of white distilled vinegar and a cup of water into a bowl and place it in the microwave. Turn the microwave on high until the solution boils and steam forms on the microwave window. Let cool for approximately 10 minutes and then carefully remove the bowl from the microwave. Wipe down the inside of your microwave to remove any remaining food particles. Spray the white vinegar on your appliances, then dry with a microfiber cloth. Dab up a small amount of olive oil with your microfiber cloth and wipe down your appliances in the direction of the grain. Do you love the sleek appearance of stainless steel appliances? Then check out our apartments in Springfield, Virginia. Each of our apartments features stainless steel appliances and a full-size washer and dryer. Our community also boasts a swimming pool and a newly redesigned fitness center.